All the news isn’t bad. And maybe today’s youth aren’t a lost cause after all. Sick and tired of big time college and professional sports? Knuckleheads running afoul of the law, the commercialism, the cheating, the excesses of competition. 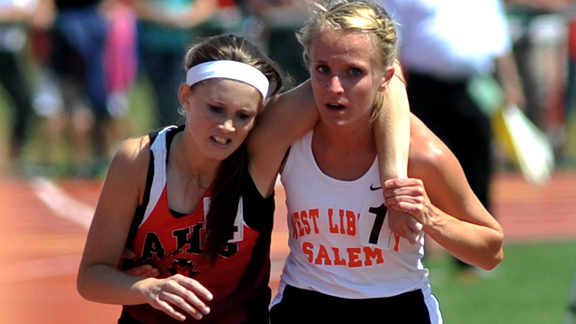 Then take a few minutes and read about how Ohio high school trackster Meghan Vogel (on the right below) recently stopped to help a fallen competitor across the finish line near the very end of the 3,200 meter final. Maybe it’s an especially touching story because we mistakenly think competition is an elixir for all that ails us. Vogel’s decision highlights the power of cooperation. Her compassion and humble response to her fifteen minutes of fame inspire me. And the surprising decision by the meet officials not to apply the letter of the law and disqualify the two student-athletes warrants praise.